According to the history books, James Wilson Marshall discovered the gold that started the California Gold Rush. But as the discovery took on the dimensions of a Major Historical Event, other folks claimed credit. The tombstone of Charles Beneath, who died in 1855 in Oregon while fighting Indians, proclaims that he was the true discoverer of gold. Mrs. Wimmer, the camp cook at Sutter’s Mill, felt that her husband deserved equal credit, and according to one story, the Wimmer children really found the gold. One tale claims that Marshall’s daughter discovered the gold. Of course Marshall never married nor did he ever have children. The first large nugget found in California was picked up on the Mokelumne River in Calaveras county in the fall of 1848 by a soldier who had been discharged from Stevenson’s New York Volunteers. After dismounting to water his horse, he stepped on a twenty-four-pound gold nugget of gold worth over $5,000. He hauled the nugget to Colonel R. B. Mason, Military Governor of California, who sent it east. Exhibited in Washington and New York, the chunk of gold lured many wealth seekers to California. And the gold kept showing up. A Southerner brought his slave with him to Old Dry Diggings, formerly Hangtown, where many of the cabins in the town were built along a ravine. The slave kept dreaming about finding gold under a certain cabin in the settlement. Finally his master dreamed of the cabin as well, so he bought the cabin. Together the two men excavated the dirt floor and panned out $20,000 in gold. Another man in the same town took $2,000 from under his doorstep. And a Downieville woman, sweeping the dirt floor in her cabin, struck it rich on account of her housekeeping. In one day, it is said, she took out $500 in gold lumps. Three Frenchmen uprooted a tree stump from the middle of the road out to Coloma and dug $5,000 in gold from the hole. A prospector staked his mule for the night, and when the stake was pulled up in the morning, there in the hole was the welcome glint of the precious yellow stuff. Along the Tuolumne River a hunter shot a bear and the bear tumbled over the edge of a canyon, landing on a ledge at a lower level. When the hunter climbed down after the bear he found that the ledge was quartz, richly laced with gold. Another man found gold-bearing quartz after a gunfight in which a bullet missed him, but dug a crease in some quartz near his shoulder; there was gold in the quartz. In Angels Camp, Storekeeper Bennagar Raspberry (also spelled Rasberry in some accounts)known for carrying exotic merchandise in his store such as champagne and caviarwent hunting one day and got the ramrod stuck in his musket. He couldn’t pull it out, so he fired it at a hillside and the ramrod went through the exposed roots of a manzanita shrub. To get his ramrod back he had to pull up the manzantia, roots and all, and, yes, there in the ground was lots of gold. The discovery precipitated a new rush. Underground mining continued here into the twentieth century. The hamlet of Soulsbyville started when Ben Soulsby settled there in 1851. He preferred lumber and farming, not gold. One day, however, his 12-year-old son, Ben Jr., literally tripped over a nugget while walking the family cow home. And so the family began digging one of the first hardrock mines in Tuolumne County. Perhaps the richest gold mines in California are located in the Grass Valley region, in the Northern Mines of the Mother Lode. Here, a cow led to the gold. One day in October, 1850, a miner named George Knight followed his wayward bossy as far as the pine-covered slope of Gold Hill. There he stubbed his toe on a piece of quartz. In the custom of all true miners, he scrutinized his providential findand promptly forgot all about his cow. Back at his cabin he pounded the rock into dust and panned out a bright showing of gold. In seven years’ time the mine produced $4,000,000. Jim Crow, a Kanaka, as Hawaiians were called at the time, jumped ship in San Francisco and joined Major Downie when he decided to prospect the North Fork of the Yuba River. Near the junction of the Sierra and the Yuba rivers, Jim caught a 14-pound native trout and boiled the whole fish without bothering to remove the contents of the digestive tract. After the edible part of the fish had been removed, he poured the remaining bits of fish along with the cooking water from the cooking pot. Jim noticed that several chunks of gravel from the stomach of the fish tended to remain behind. He found small bits of gold in the form of river-worn nuggets. Apparently the fish had swallowed them along its food. Although Jim actually discovered the gold, Major Downie got the credit. Later, Downieville was named for the major. And talk about belated luck. 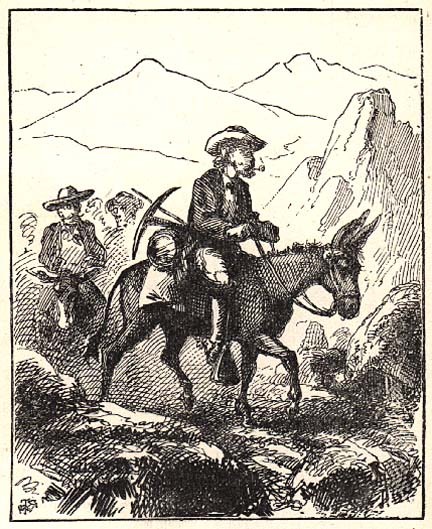 An homeward-bound miner was crossing the Isthmus of Panama in late 1850 when a train of mules crowded him from the jungle trail. Forced to step into the underbrush, he saw there a folded blanket. Opening it, he discovered $4,000 in gold dust.